Coming in at No. 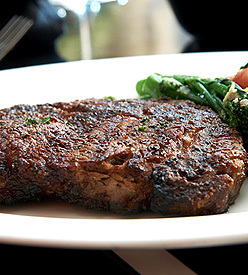 7 in our 2011 Best Steakhouses issue, Ed Bailey’s upscale steakhouse offers prime steaks ranging from 8-ounce filets to 22-ounce bone-in rib-eyes, all of which come with asparagus and potato. The “ladies’ steakhouse” theme could benefit from a little better service, especially from the female servers, but the lobster-stuffed avocado, crab cakes, and bacon-wrapped shrimp redeem any lapses.